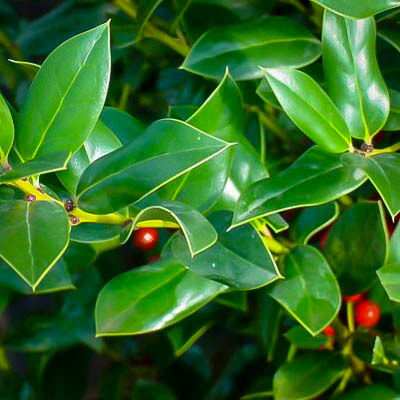 The Needle Point Holly is one of the best holly bushes available. It grows into a tall and broad specimen, with glossy, rich-green leaves that are smooth except for a single spine on the tip. It produces a huge crop of large, bright-red berries even on a single bush. It will grow in exposed areas in full sun, or in partial shade, and it thrives in difficult soils, including alkaline ones. It is also a great seaside choice, since it is resistant to salt spray too. It is pest free and deer avoid the sharp spines. Plant it as a single garden specimen or use it for an attractive screen or trimmed hedge. The Needle Point Holly is renowned for its ability to thrive in difficult soils, resist salt-spray and grow in harsh locations. Choose a sunny or partially shaded spot to plant it. Once established it has good drought tolerance, and will still produce a huge berry crop even in poor conditions. Do not plant where the spines can be a problem, but equally, unwanted visitors will never push through a hedge or screen of this plant. 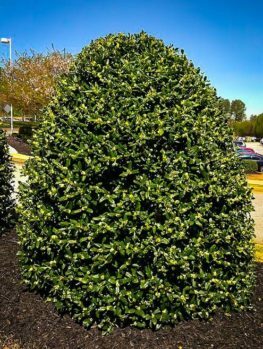 Holly trees and bushes are a diverse and useful group of plants in any garden. 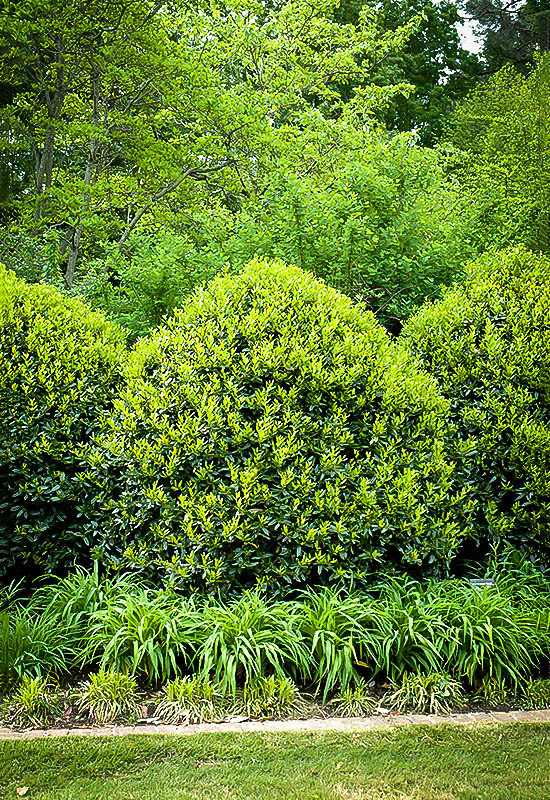 Mostly evergreen, with glossy, rich-green leaves, they are stand-out plants for structure and form, as well as excellent choices for screens and hedges. 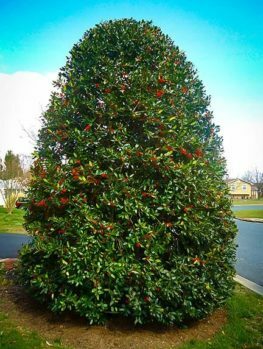 The horned holly is not as widely grown as some others, but if you are dealing with difficult conditions, such as salt-spray, alkaline soils and other harsh factors, the form called the Needle Point Holly is a top choice. 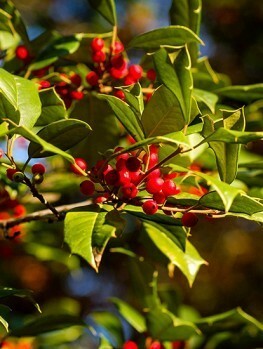 Not only is the Needle Point Holly hardy in adverse conditions, it is also one of the most prolific berry producers of all the hollies, smothered in large clusters of big, red berries all winter long. 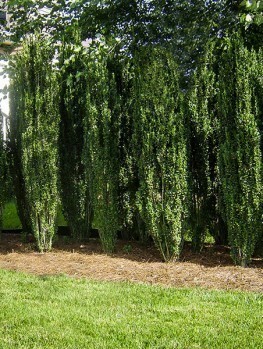 Combined with its attractive glossy, evergreen foliage, this is a plant that should be planted widely. This is a great choice for a very ornamental plant that can cope with difficult conditions. It is not often available, and we have a good stock of excellent plants. 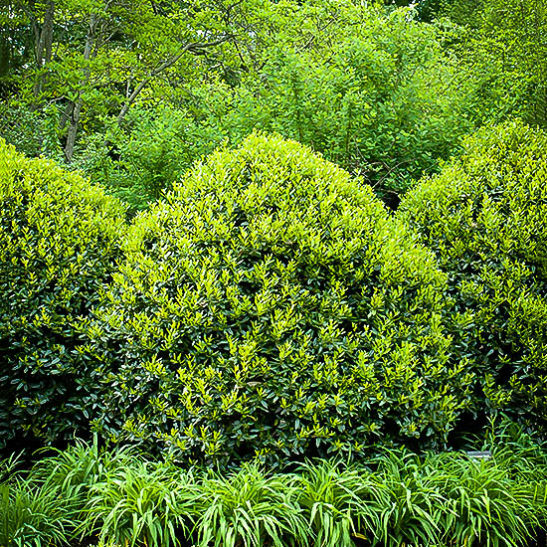 We know that the demand will be high for such a desirable bush, so order now while stocks last. The Needle Point Holly grows rapidly – as much as 3 feet a year – to soon reach 10 feet and perhaps 15 to 25 feet tall, if left untrimmed. It has an upright form, spreading out to 10 feet wide and ultimately to no more than 15 feet across. Most mature trees in gardens are around 10 feet tall and 12 feet wide, so allow enough room when planting. The name ‘Needlepoint’ refers to the foliage (not the form) of the plant, which is broad and full, not narrow and upright. When it comes to choosing locations for this plant, we really see what a great performer it is. It will grow well all through zone 7 and in warmer areas too, even doing well in harsh, prairie locations like southern Oklahoma. It will grow in all kinds of soils, including difficult alkaline ones, and wet or dry conditions. It even grows well in coastal areas and it is very resistant to salt spray, from the ocean or from highways. It will grow in full sun or partial shade, so there are lots and lots of locations where this plant will thrive and outperform most other plant choices. Even if you have an ordinary, sheltered garden with good soil, do not think of this plant as only for harsh conditions – it is a great all-round garden plant too. 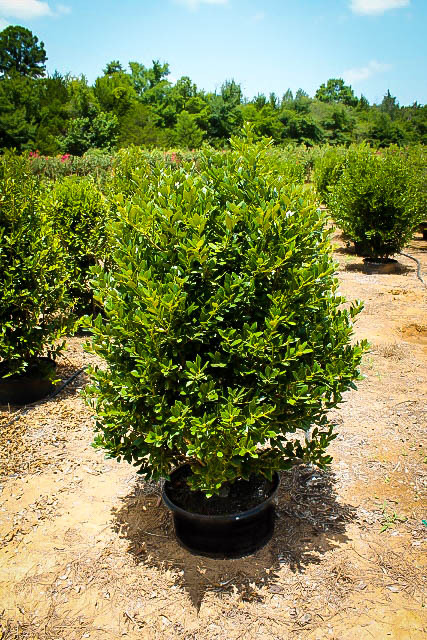 As a single specimen, a group, or planted as a hedge, this holly will rapidly develop into an attractive plant. With its winter-long crop of berries it will look at its most attractive just when other plants are taking a winter rest, and the garden is often dull. 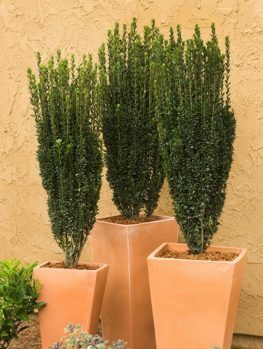 Specimen plants will grow dense and full without trimming, although plants can be trimmed in early spring to keep them smaller. 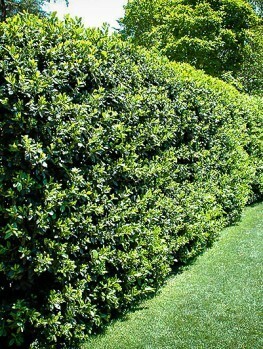 For a hedge, plant in a row, spacing the plants 3 to 5 feet apart. 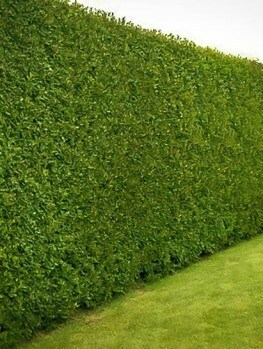 Left untrimmed it will make an attractive screen, or trimmed in early spring, a neater hedge. More frequent trimming may reduce berries, but a very neat and tight hedge can easily be made. The leaves are smooth and glossy, narrow and up to 2.5 inches long. The margin is smooth, but at the end is a single sharp spine, which gives the plant its name. Avoid planting near spaces where these spines could easily prick someone, but of course when turned into a hedge, you have something that unwanted visitors will never be able to push their way through. The flowers are inconspicuous and nestle among the leaves in spring. In fall a heavy crop of bright red berries develop. These are larger than those of most other hollies, and a second tree is not needed for pollination. The berries are eaten by birds, but many remain all through winter, brightening the garden, and making great decorations and wreathes for the holiday season. The horned holly (Ilex cornuta) grows wild in China and Korea, and it was brought to Europe in 1846. It probably arrived in America a little later. Wild plants are variable. Some can be 60 foot trees, while others are smaller shrubs. The Needle Point Holly is a carefully selected form, chosen for its compact structure, dense growth and abundant berry crop. Cheaper seedling trees will be very variable, and not predictable in their growth. 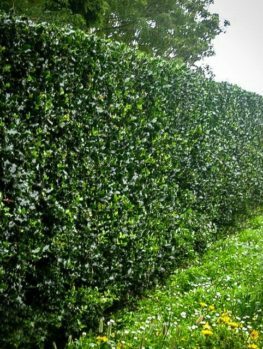 Particularly for a hedge, it is very important to have plants of a uniform habit, so avoid cheaper plants and make sure you are buying the true Needle Point Holly, for the best results.